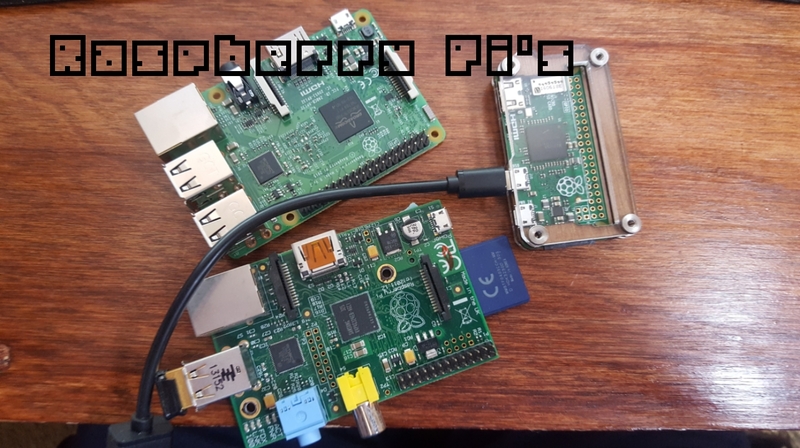 I have four Raspberry Pi’s. Two raspberry pi 2 model b’s, one zero, and one Raspberry pi 3. I also have one camera module, a pi-face, among some other nic-nacs for the pi’s here and there. Now I understand compared to some other folks 4 Raspberry Pi’s is no impressive thing, however it’s not the number of pi’s you have but how you use them 😉 . In this post I want to briefly reminisce about some of the past projects with my Rapberry Pi’s and ask for any feedback or suggestions for future projects an n be experiments. My first taste and/or experience with Python is because of the Raspberry Pi’s GPIO. This lead me to my first hello world Python program and my first ever hello world Raspberry Pi LED blinking project. Which the joy I felt after I got a computer to interact with real world objects, like a LED was something I cherish to this day and give some credit to my enthusiasm into electronics. Now i understand now that this might be very underwhelming and unimpressive, however at the time it was such a thrill being able to program this little credit sized computer to control a LED. This was a fun project. Like many people I kept forgetting to feed my goldfish. Now those little guys didn’t deserve that. So I had a thought, “Why not automate it with one of my Raspberry Pis!” So that is what this project was set off to do. Now this was a lowly attempt as this was one of the very first projects I had ever attempted. Just a little side note I have since learned much better way of doing this. Anyways, I hooked up a Servo motor to the GPIO pins on the PI. Then everyday at 7:00 a.m. I would spin the servo motor which was connected to an old plastic container, that had fish food in it. Presto, the fish were feed and I made a neat project with my Raspberry Pi. A minor set back of this was, I was clearly overfeeding the fish, therefore the algae was a quite a problem. Yet, it was still a cool fun project. Now i did this projects many years ago, and since don’t have the goldfish any more, so I don’t have any pictures. However, here is a video of the gold fish. The Pi-Dozer was an awesome project and idea. I was awarded around $300 dollars worth of Raspberry Pi and Raspberry Pi accessories to create the Pi-Dozer. Although have had many critics in regards to project (And now looking back on it, I can clearly see why, I mean just read the comments on Hackaday when they featured the Pi-dozer.) I believe this project was a good stepping stone for me. At the time it was a little bit more of a complex project using the electronics giving to me. I only have one regret in regards to this project. I wish I would have spent more time into it. Has it being a challenge there was a strict timeline for when it had to be completed, and the finished product that you see in the video is the product of only about three hours of total time spent into it. At the time I was working full-time and still at university. But with that out on the table, it was still quite a fun experience for me. Here is the video of me opening all the contents of the challenge. Here is the final product (3 hours of work) it was a bit rough. I had fun, and it was a great learning experience for me. Be sure to watch to the end as there is a slide show at the end. Just a thought, I hope to revisit this project one day. I think it could really have some potential. The reason I wanted to reflect on these projects is because look at the tiny fraction of things I have done with these bad boys. Not don’t get me won’t I learned tons by doing these projects, but the point is the Raspberry pi opens so many possibilities. I think this is why it has become so popular, and the world’s best selling single board computer. It’s because it had an unlimited amount of used, and more then one purpose. Ever since I’ve learned about this little computer back in 2012, I’ve been every so fascinated with it. I just wanted to pay a little respect and remember how far I have come in regards to programming, electronics, and simply all things tech, and how this little computer has helped evolve that. I want to thank Ebon Upton and the Raspberry pi Foundation for something spectacular that they created and continue to develop. Thank you guys! I had a Raspberry Pi Zero W given to me. These little boards are awesome! I am using this rpi currently as a retropie set up. Here is the video for it. I am consistently looking for new ways to utilize this awesome little computer. If you have any project ideas leave me a comment below, and I might attempt it. Subscribe, or follow me on twitter to get updates, and new articles on many more projects to come.